(Lanka e News 28.Aug.2018, 4.20AM) Clause 4(2) of the 19 th amendment to the constitution clearly stipulates ‘ the individual who was elected by the people to the post of executive president twice cannot be elected again to the same post by them’. 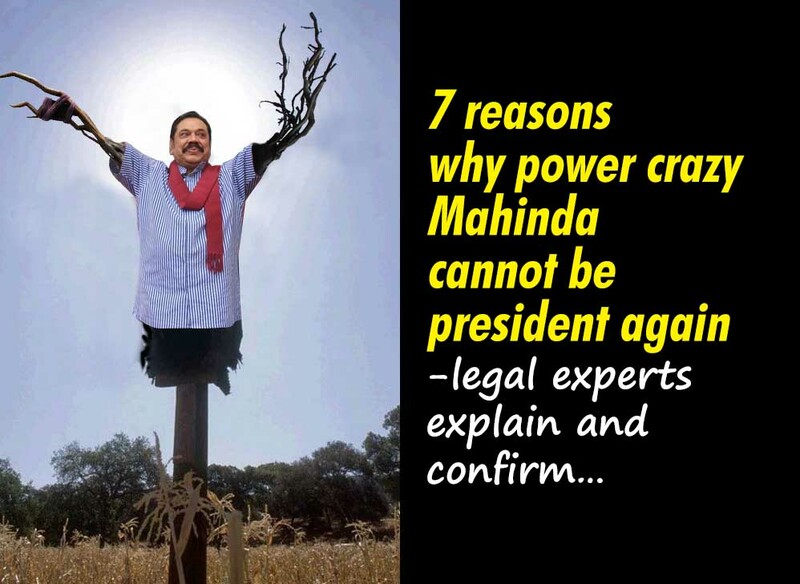 Despite this , the legal lackeys of Mahinda Rajapakse (who held the post of president twice) have advanced the contention that ‘Mahinda can again contest the presidential election’ . 1. Firstly , before the Mahinda Rajapakse faction sought the opinion of the supreme court (SC) regarding the presidency in the 19 th amendment ,the incumbent president Maithripala Sirisena himself had inquired about it. That is whether the tenure of office of the president is 6 or 5 years. The verdict of the SC was , the presidential period is 5 years. In other words , even the incumbent president is subject to the terms and conditions of the 19 th amendment..The argument advanced now by the lawyers of Mahinda Rajapakse ,that the terms and conditions of the 19 th amendment apply not to the present president but to the future ones , and that it starts with the future presidents, if it is true , the tenure of office of president as per the SC verdict has to be 6 and not 5 years because at the time when the present president was seeking elections the period was 6 years. Hence it is abundantly clear the terms and conditions of the 19 th amendment is valid even now , and not only from the future. That means Mahinda who was president twice cannot field as presidential candidate again. 2. It is very unfortunate Mahinda and his lawyers have misunderstood and misinterpreted the 19 th amendment by viewing from a wrong angle which is based on the disqualifications mentioned in the 19 th amendment that those apply not to the present president in office but from the next presidential elections. In order to analyze and elucidate the position, let us assume , at the last presidential elections it was Ms. Chandrika and not Sirisena who contested as presidential candidate . According to the constitution at that time , a president could hold that post any number of terms , and therefore assuming Chandrika contested as president and won, in such an event what was amended by the 19 th amendment to stipulate a president who held the post twice cannot again field as presidential candidate under the 19 th amendment will not apply to Chandrika who is in power as it is applicable only from 2020 presidential elections . However she cannot field as a presidential candidate in 2020 , and can hold office until that time only. It is being argued the disqualifications in the 19 th amendment do not apply to the present president , and only from the next presidential election , for the sole and whole purpose to cling on to some stray point and eliminate via the constitution itself the obstacles militating against the present president , and to help him continue. 3. Mahinda and his lawyers are entertaining a misconception that the disqualifications stipulated in the 19 th amendment do not apply to the incumbent president based on the notion that those do not relate to all the presidents who held the post though that is not the case. It is to be noted the disqualifications in the 19 th amendment apply to everyone else. A case in point is the court decision on Geetha Kumarasinghe’s dual citizenship. The supreme court decided that she cannot be an M.P. based on the 19 th amendment which disqualified her . If the contention of Mahinda and his lawyers are valid , she ought to be an M.P. still and will become ineligible only in 2020. But that is not what happened. 4. Another argument of Mahinda and his lawyer lackeys is even more ridiculous. That is, the contention , by the 19 th amendment it is not the existing old post of president but a new presidential post was created. That too is untrue. If that argument is tenable president Sirisena should take oaths again under the 19 th amendment . That did not happen because article 49 (1) (b) makes the position very clear. It states , ‘the individual who held the post of president before the 19 th amendment was passed shall after that date abide by the terms and conditions stipulated in the 19 th amendment’ Therefore the 19 th amendment has not created a ‘new presidential post’. 6. The ex chief (cheap) justice Sarath N Silva who advances legal arguments on behalf of Mahinda had this to say : A constitutional amendment is not an article specifically and must be considered generally. That is true. The 19 th amendment was brought in to rectify the flaw that a president can contest the presidential elections any number of times, and to limit it to 2 terms . If the argument of Sarath N Silva that it should be considered generally and not specifically is to be accepted , then Mahinda who was president for two terms cannot any way contest the election again. 7. When ex deputy speaker Chandima Weerakody said the 19 th amendment was not an amendment but a counter proposal , the legal draftsmen and experts remarked , those are not legally based arguments but nonsensical utterances of idiots who do not know the laws and the language. In the circumstances if anybody in the opposition is dreaming that he could make Mahinda the president again , he/ she will be well advised to wake up to reality and right now get ready to choose a suitable presidential candidate.